Around the middle of the 16th century the “South Sea,” as the Pacific Ocean was formerly called, was full of vessels plying the waters between Valparaíso, the principal port of the Kingdom of Chile, and El Callao, its counterpart in the Viceroyalty of Peru. These journeys took several months, depending on the strength of the winds and ocean currents, as the voyages of Juan de Saavedra (1536) and Juan Bautista Pastene (1542) demonstrated. The latter sailed the coast of Arauco from 1550 to 1552, plotting the location of Valdivia, Isla Mocha, San Pedro and Penco bays and Isla Santa María. The Spanish conquest of Chilean territory occurred in concert with the mapping of its coastline, river mouths, sounds, natural ports and islands. But what was across the water, far from the El Callao-Valparaíso route? In voyages undertaken between 1563 and 1575, Spanish navigator Juan Fernández showed that the distance could be crossed quickly; he also discovered yet another archipelago, which bears his name today. The Southern Sea was a vital connecting route between Chile and the viceroyalties of Peru and New Spain (Mexico), the Spanish Empire’s two main political and administrative centers in the Americas. This Pacific coast route enabled the transport of supplies to provision the conquistadors moving through the territory and allowed merchandise to be shipped between these different ports as well as to and from Spain. The Kingdom of Chile maintained two maritime routes: the Strait of Magellan (1519-1520) and the Cape Horn route (1616). They allowed vessels to transit from the Atlantic to the southeastern Pacific, Polynesia, the Philippines, Indonesia and the Far East. In the centuries of colonial rule, the coasts of the Kingdom had to be protected against the commercial expansion of other European powers that were enemies of the Spanish crown. English and Dutch pirates were also a concern in these waters, interrupting commercial traffic and looting coastal cities and enclaves. They established several refuges and provisioning sites on Pacific islands, including the Juan Fernández archipelago and Isla Mocha. When, therefore, did Easter Island—known today as Rapa Nui (Big Island)—enter the colonial imaginary? In 1684, the English pirate Edward Davis was sailing to Southeast Asia in search of riches when he came upon the Juan Fernández archipelago, and in the time he spent in the area he seriously disrupted Spanish colonial commercial traffic. On one of his voyages to Polynesia, in 1687, he saw an island but did not land on it. Back in Europe, the existence of a mysterious island in the middle of the ocean, guarded by high cliffs, with forested hills, thickets and grasslands, was included on maps with the name of “Davis’ Land.” In 1721, in its constant search for new possessions, the Dutch East India Company sent a fleet of ships out under the command of Jakob Roggeveen, charged with locating Davis’ Land, among other objectives. It sailed from Amsterdam, following the Atlantic route to Cape Horn then sailed up the southern coast of the Kingdom of Chile to reach Isla Mocha and Juan Fernández Island in 1722. The ships continued their voyage and came upon an island more than 3,500 km from the mainland at the same latitude recorded by Davis, though the size of the island was different. On Easter Sunday 1722, the island was baptized as “the easternmost” or Easter Island. The men disembarked and briefly toured the island, and were impressed by the hospitality of its inhabitants, the Rapanui people, who were nonetheless wary of the firearms that the sailors carried on the three ships of their fleet. An account of the expedition was not published until 1838, at which time the towering stone sculptures—known as moai— erected in the north and south zones of the island had a great impact on the European public. After this initial encounter, this island of Polynesian sailors, farmers and fishers remained hidden from the West for many years. Several expeditions attempted to locate it, including the circumnavigation led by English captain John Byron (1764-1766) and French captain Louis Bougainville (1766-1769). Around 1769, a fleet Spanish Armada ships under the command of Felipe González de Aedo sailed from El Callao with the intention of finding Davis’ Land. The men found the legendary island and named it San Carlos. 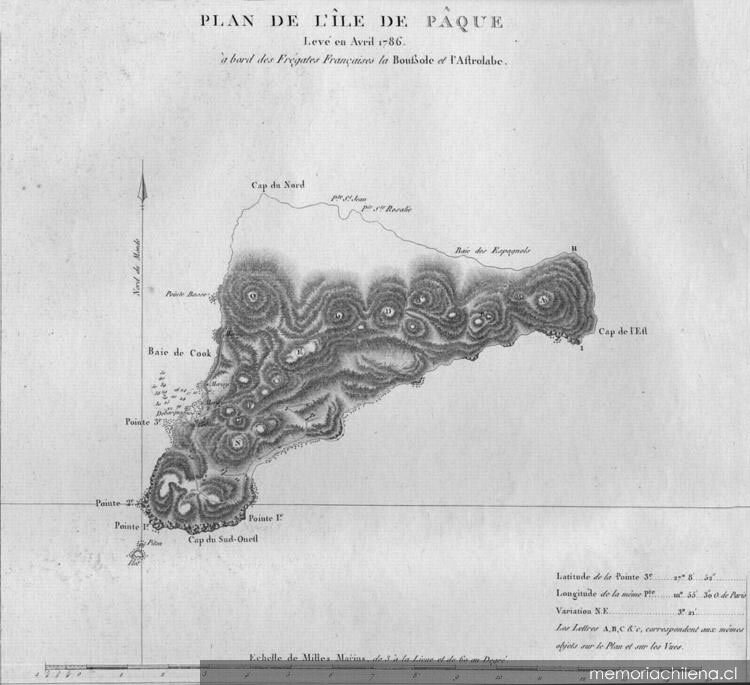 They explored the island, sketched its layout and elevations, and collected information on its population and resources. They also sketched the enormous stone statues with imposing heads—the spirits of the ancestors of each lineage carved in rock—that the natives revered. In 1774, English commander James Cook disembarked on the island, explored the locality of Hanga Roa and journeyed to the interior. He was accompanied by German naturalist Johann Reinhold Forster and English artist William Hodges, who drew the moais in their natural surroundings and light. These illustrations would come to be engraved on the European imagination. In 1786, the French expedition led by Admiral La Pérouse also briefly visited some of the island’s sites. In the 19th century, a new historical period began, with contact of a different kind between Rapa Nui, Europe and the American republics. In 1805, a group of North American whale and seal hunters disembarked on the island, kidnapped a group of natives and took them to Juan Fernández Island to work as laborers in their industry. This highly profitable business was meeting a growing demand for the oil, skins and cartilage of these animals in the markets of Europe, China and the United States. Rapa Nui became a valuable source of slaves and forced labor for this arduous trade and for the guano trade on the Peruvian coast; in 1863, close to 2,000 Rapanuis were taken as slaves to that country. One of the most serious consequences of this new development was the sharp decline in the population, which was aggravated by the introduction of infectious diseases such as smallpox, tuberculosis and syphilis. Around the same time, missionaries began to convert the island’s population, which now numbered around 1,800. Looking at this long history, questions arise: When the Polynesian and European navigators met, why did they not accept each other equally, as men of the sea? What place does the Rapa Nui standard occupy today among Chile’s patriotic symbols? Who are the Rapa Nui people today? These questions deserve to be answered.